Sharpcut Trimmer features a self-sharpening stainless steel blade that cuts up to 15 sheets at once. 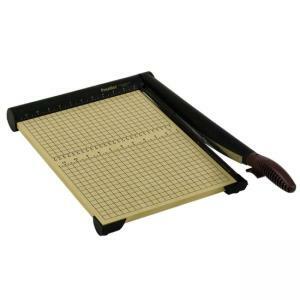 Heavy 1/2" wood base offers permanent alignment grid for precise cuts. Trimmer has Imperial and metric rulers, patented automatic blade locking system, torsion spring and fingerguard for safety.